Although opinions on the term pet “parent” may vary, there’s no denying the fact that pet ownership is a big responsibility. In households without children, dogs often get lavished in especially large amounts of love and attention. So what’s Fido to think when suddenly a tiny human enters the picture? While he may soon bond with the new addition, your dog may not immediately be thrilled by the presence of a screaming, time-stealing infant. Studies show that dogs, like humans, can experience feelings of jealousy and insecurity. For this reason, it can be beneficial to prepare your pup for the arrival of a new baby. The preparation process can begin as soon as you find you’re expecting, but pet owners should continue helping their dog adjust as the baby grows. Your dog probably has a daily routine. 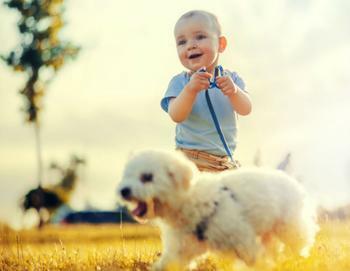 It’s important to start changing that routine to match whatever the dog’s new routine will be once the baby arrives, says Michael Wombacher, a professional dog trainer and author of "Good Dog, Happy Baby." Expectant parents can begin shaking up the routine a month before their due date or the moment the pregnancy test turns positive. What’s important is that the dog not be given any reason to negatively associate the changes with the baby. Does your dog have soft, tuggable ears or a wagging tail that looks irresistible to grab? By 8 months of age, your baby will probably begin noticing -- and reaching for -- some of the more sensitive body parts on your fur-covered family member. During the months leading up to this tactile phase, you can prepare your dog by conditioning him to be used to awkward grabbing and pulling. Wombacher notes that it’s also vital that dogs be given a “safe zone” to retreat to if the baby’s touching becomes too stressful. It is during this phase that parents can also teach the family pet not to confuse dog toys with baby toys. The two types of toys may be similar in appearance and in noise-making ability, but Wombacher says dogs can easily learn how to distinguish between what’s theirs and what isn’t. How? Simply dab a little Listerine on the baby’s toys and teach your dog that the scent of Listerine equals an "off" command. When your little one has gone bipedal, you can begin creating opportunities for structured, positive interactions between your child and your dog. This can include games, rudimentary pseudo-training, and more. During each of these phases, it’s important to remember that dogs and babies should never be left unattended together. But teaching your pooch how to interact with the newest member of the pack from the beginning can help pave the way for a harmonious and loving future, says Wombacher.